I get a few questions about the line capacity of my reels. So I did a study to try to see how commercial reel manufacturers rate their reels. Many have ratings (line size + yards of backing) on their web sites, and the subject line is always a WFxF type. I took my dial caliper and visited a couple local fly shops, where I made measurements of spool dimensions. From these measurements and the principles of solid geometry, I calculated the volume of the spools, if filled out to the rim. My purpose was to discover what volume is left on the reel spool after the rated yards of backing have been installed. This volume represents the volume needed for a neatly-wound-on fly line, plus the extra space that should be allowed when the line less neatly wound on. To know the volume occupied by the backing, I bought a 20 lb./100 yd spool of Scientific Anglers backing (3M P/N 34-8505-9217-0). By winding this onto a bare spool, I found that it occupied 1.10 cubic inches. This backing diameter is .010 inch, measured on the flat part of my dial caliper jaws. 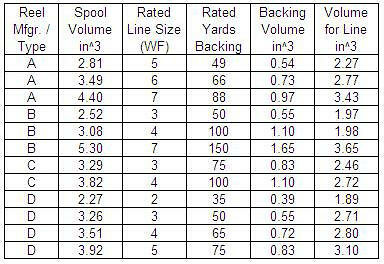 And here is the data for four manufacturer/model lines of reels. 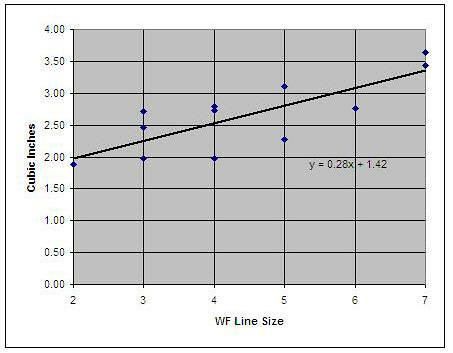 Here is a graph of the last data column plotted against WF line size, along with a “trend line” as established by Microsoft Excel. You can see that there is considerable variation from the trend line. Is the trend line a good guideline for reel design? Consider the Pflueger Hawkeye that I showed on 3 Dec 2011. It has a 1.8 cubic inch spool and was wound with just a WF3F and no backing. I would say that the spool was somewhat more full than I would like to have it (i.e., danger of a jam against the pillars when winding on frantically). The 2.25 cubic inch space recommended by the trendline would be more comfortable. The photo below shows one of my reels with a 4.3 cubic inch spool. It has the 100 yards of SA backing wound on, plus a Scientific Anglers “AirCel” WF5F. The trendline says that the line should be allowed 2.8 cubic inches, leaving room for 1.5 cubic inches (136 yards) of backing. I would say that is about right. This entry was posted in Spool. Bookmark the permalink.